It is widely believed that the critically literate graduate – our goal in education – is measured in terms of the skills and behaviours to comprehend, problem-solve and apply new learnings in different contexts. These literate learner skills are foundational and underpin many of the ‘in vogue’ theories purported to be ‘the answer’ today, like problem-based learning, project-based learning and deep learning. problem-solve (adapted from Sharratt & Harild, 2015). As educators, we begin with literacy instruction as a must in kindergarten; continue with support for strong classroom instruction, including a balanced literacy approach and cross-curricular literacy; and conclude with collaborative inquiry in any form – only after the critical concepts in the list above are in place. With foundational literacy skills in mind, I will now explore three practical learning, teaching and leading approaches – writing to improve critical literacy skills, bump-it-up walls, and collaborative assessment of student work – that support teachers’ focus on our end goal: the critically literate graduate. Writing unlocks the capabilities of the critical thinker. Therefore, the power of writing is not to be dismissed. After watching students as struggling readers come alive with daily opportunities to write about the ordinary things that were important to them, I became a firm believer that if you can read you can write, and if you can write you can read. Too often we miss the opportunity to use writing to teach reading and vice-versa. Most students can’t wait to write about real-life happenings – that are only sensational to them, like David’s ‘My New Hair Cut’ or Jeffery’s ‘We Went Tobogganing Last Night’, and so on. The audience and purpose for writing across the subject areas has to be authentic and relevant to our student writers. In Science, Geography, or Maths, the ability to write detailed observations, or steps in the solution to a ‘wicked problem’ depends on the ability to read and comprehend what is being read. Using writing in various subject strands informs teachers about the level of literacy as much as it informs teachers about the level of subject content developed. At that point, the teacher becomes a teacher of literacy – helping students uncover the language of the discipline. Critical thinking skills used in writing include: questioning, hypothesising, interpreting, inferring, analysing, comparing, contrasting, evaluating, predicting, reasoning, distinguishing between alternatives, making and supporting judgements, synthesising, elaborating on ideas, identifying values and issues, detecting bias, detecting implied as well as explicit meanings (Sharratt, 2019). These critical skills used in writing must persuade teachers in every subject area to see themselves as literacy teachers first, and subject area teachers second. The power of non-fiction writing is a secret to be uncovered. I have found that when teachers let students write about things they want to know more about, student engagement skyrockets and bursts into student empowerment. Students can’t wait to share with a writing buddy or meet the teacher in a small group to find out when they can do a final proofread and then publish their masterpieces. It is a celebration not to be missed when the ‘published author’ proudly presents her book before an audience of keen parents and caregivers, or to the principal and assistant principal. Then comes the special occasion when the published book is coded and placed in the school library for all to sign and comment on when they have finished reading (Sharratt, 2019). The power of writing leads me to ask, ‘How do students’ know what their expected next steps to improvement are in writing?’ One answer is to make very clear, visually, to students what the expected steps look like, using bump-it-up walls. 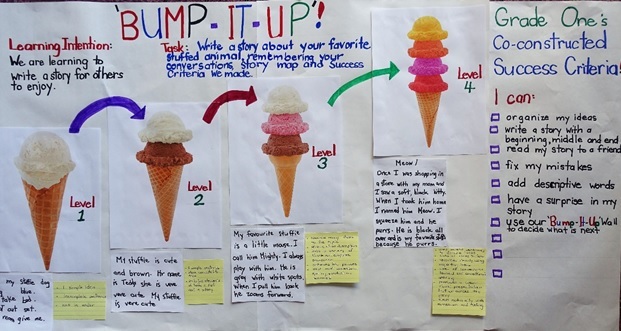 When teachers collaboratively design a writing continuum or ‘bump-it-up wall’ to engage students in authentic, purposeful reading to inform their writing, the curriculum reaches into the hearts and minds of the students. A co-constructed writing continuum using the curriculum achievement standards is a powerful way to make teachers’ expectations explicit, real and visible. Students need to understand the curriculum expectations and have them written for them in student-friendly language. The writing continuum is a high-impact instructional tool to assist students in self-assessing where they are and where they need to go – that is, being able to ‘see’ the next level of attainment for themselves. The writing continuum process, across the subject disciplines, assists all students but begins with teachers and leaders first experiencing the development of a writing continuum. When I have used this co-construction process with teachers and students at every grade level, I always get the same reaction: ‘This is so valuable, why didn’t I know about this before?’. Canadian teacher Elaine Krause (of the Saskatoon School Division, Saskatchewan) literally brings in buckets of books filled with different kinds of literature and discusses with students how authors use conventions and writing traits to convey their ideas. This is before she starts building a writing continuum with her students. They co-construct and display many visible anchor charts (scaffolds) about what good writing looks like, sounds like and how it makes them feel. Krause spends a great deal of time selecting materials from different genres and different types of writing to use as examples. She also shows many types of anonymous student writing and has the students practice making notes about the attributes of these writing samples. From there, they launch into the actual building part of the continuum (In Personal Communication, June 2017, in Sharratt, 2019). As shown in Figure 2, a co-constructed classroom writing continuum provides exactly the ‘clarity’ needed so that students can visibly see how to become self-assessment capable – knowing and owning their next level of improvement (Sharratt, 2019). Source: Dr Lyn Sharratt, May 2018, in CLARITY, 2019.
move students from one level of work to the next and beyond their assumptions. Notice in this title that I didn’t say ‘moderated marking’. Collaborative Assessment of Student Work (CASW) is not just about deciding on a grade or mark for a piece of student work. It is a three-step process. First, CASW is an opportunity to bring a piece of student work to a collegial group of colleagues where the group provides the teacher with descriptive feedback on the task, on the success criteria and on the piece of student work being presented. Second, CASW is a forum to discuss descriptive feedback for the student. In this part of the process, it is important to think about two points that the student has done well against the success criteria, and at least one thing the student could work on that reflects the co-constructed success criteria for the task. This is most powerful when the feedback includes an example of the next steps for the students and the teacher finds time to share the feedback directly with the student – checking for understanding. Third, CASW provides the teacher with recommended next steps in her instruction. CASW is a sophisticated learning approach that builds teachers’ and leaders’ capacity to instruct all students and differentiate approaches to meet each student’s needs. When CASW is ongoing and timely, it reaps huge benefits for teachers and students. Cluster 5 ­– a low socioeconomic area within Sydney Catholic Schools comprised of 14 primary schools in the Inner Western Region – is considered one of the most diverse clusters in the diocese. When instructional coaches in Cluster 5 focused on these three areas – writing to improve critical literacy skills; bump-it-up walls; and CASW – to improve writing, they saw huge increases in their school achievement results in writing. They also noted other evidence of impact, such as the language of improvement became consistent, and the questions of inquiry across all schools were focused on student growth, teacher knowledge and expertise. Just 24 months into the project, NAPLAN data showed improvement in reading, writing and numeracy across Cluster 5. Specifically, in Year 3 writing the 32 students in the bottom two bands initially were reduced to 11 students; and in Year 5 writing, 46 students were reduced to 43 students. In the top two bands in Year 3 writing, 344 students increased to 407 students, and in Year 5, 77 students increased to 109 students. These data suggest that continuous improvement was happening at all levels of the Cluster 5 schools when their strategic approach was to focus on writing to teach reading and reading to teach writing. Most importantly, the learning culture showed a continually-developing shared understanding of what is expected at every level. All teachers shared a common understanding of the learning that is required to have every student succeed. Having students and teachers write, habitually, to record thinking, reflect on progress and share new ideas and experiences with others creates a habit of mind that will make them stronger in their relentless pursuit of knowledge-building across all subject areas. Sharratt, L. (2019). CLARITY: What Matters MOST in Learning, Teaching, and Leading. Thousand Oaks, CA: Corwin Press. Sharratt, L., & Harild, G. (2015). Good to great to innovate: Recalculating the route to career readiness, K–12. Thousand Oaks, CA: Corwin. Dr Lyn Sharratt says that when teachers let students write about things they want to know more about, student engagement skyrockets. How often do you encourage students to write about topics of interest to them? What impact does this have on student engagement in your classroom? Bump-it-up walls are one approach to show students what the expected steps of a task look like. How do you show students what is expected of them? Could bump-it-up walls improve your processes?